The November 22nd, 1880 Tombstone Epitaph. Drew's Station is not listed as a stop. The Earp field is certainly a playing field of plenteous research and differing views. But most of the researchers I know truly love the history. Given missing historical records, not all of the facts and circumstances of events in the San Pedro Valley could ever be 100% verified. It is fair to respect the research, opinions, and even hypotheses about people and events which are presented by historians, especially when formulated using available documentation. Interesting discussions have usually resulted, which add clarity to the field. At the same time, sources should be carefully analyzed for certain things like bias (newspapers, letters) and first vs. second or third hand accounts. Also, some of the documentation we use consists of recollections written down at dates far removed from actual events. Such is the case with James Wolf, of Charleston fame, as well as Cora Drew Reynolds of Drew’s Station. Her memoirs were published in July of 1951. She states, “My memories now go back nearly eighty years.” There are a number of problems with her recollection. She said that “my father passed away in November of 1880.” Newspaper accounts place his death one year earlier in 1879 (Arizona Citizen, December 19th, 1879), and public records show her father dying of typhoid in November of 1879. She also places the location of her father’s stage station at “a spot on the San Pedro River about eighty miles north of Tucson which was our closest trading post.” This of course is incorrect. That is why it is extremely important as researchers that we attempt to verify events, people and places with other primary sources. Remember, too, that Cora’s memories are that of an eight year-old child who may not have had a full understanding of events happening around her. (Cora was born on August 9th, 1872) But her statements should be taken as fact when they can be verified by other sources. Kenny Vail, aka K.t.K, stated that he knows of two other contemporary accounts which match Cora Drew’s statement that the holdup of Bud Philpot’s coach took place north of (on the Benson side of) Drew’s Station. He should publish his claims and show his sources. Paul sent his telegram from Benson TO Tombstone. He would be describing the robbery location to authorities in Tombstone so they could get there in as little time as possible. His description was so accurate that by the time he returned to the scene of the murder Philpot’s body had already been removed. Remember that Bob Paul was a 51-year-old man who was familiar with this route and sat next to Philpot and returned fire. Another fact that should be considered in Cora’s account of the robbery is that by November 1880 (months before the Philpot murder of March 15, 1881), Drew’s Station had been replaced by Contention as the area stage stop. 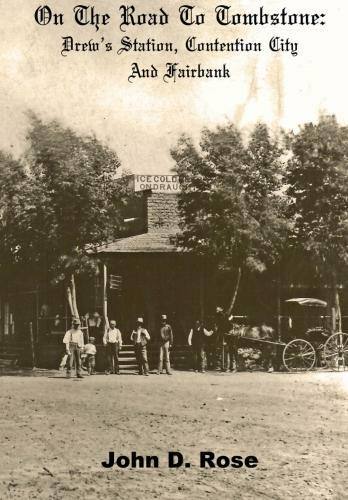 On November 22nd, 1880, The Tombstone Epitaph advertised that the Arizona Mail and Stage Company offered fares from Tombstone to Benson, Tombstone to Charleston, Tombstone to [Camp] Huachuca, Tombstone to Harshaw, and Tombstone to CONTENTION CITY, all on a daily basis; there was no mention made of Drew’s Station, which could no longer compete with all that a city such as Contention had to offer travelers. By the evening of the Philpot/Roerig shootings, commercial stage lines no longer stopped at Drew’s. Cora Drew claims that Philpot had stopped at their station on the evening of his death. “Hardly had we said goodnight to Bud and he had reached the narrow wash to the north when we heard a shot ring out.” Cora is likely confusing the night of the robbery with others in earlier times when Philpot did stop there. Cora also claimed to have witnessed the gunfight near the O.K. Corral. Her description is in conflict with the testimony established in the wake of that event. Many of Cora’s statements in her memoirs are correct, but many are unfounded by other historical records. An account of this type can be valuable to verify events, but is most valuable in giving the reader an idea of day to day life in a specific place and time. Kenny Vail’s faith in Cora’s statements about the Philpot murder is not well-founded. As to the location of Drew’s station, Mr. Vail has stated he has a map of its true location. Why not post that on the internet? If Mr. Vail is interested in making his point to the historical community, it would be proper for him to show it to us. Just to set the record straight, some of Kenny’s rancor against me may have originated when I offered him a publishing opportunity years ago with the nation’s top-selling western history magazine. For some unknown reason, he never responded to me, but expected I would answer his subsequent, angry emails about my website. His emails contained unsubstantiated information with no sources. If he wishes to be published at some point in time, he will have to provide the sources to ensure the credibility of his work, as any of us do. The amount of personal loathing you express for Casey Tefertiller and myself is very disturbing not for what it says about Casey or me but for what it reveals about you. Something is seriously wrong when a mature man publicly displays such blatant contempt for two people he hardly even knows. Does it really make any sense for a man of your years to publicly carry on like this simply because Casey and I differ with you on Wyatt Earp? Kenny, I don’t know what your problem is but I do know you have a problem and it really needs to be addressed by professional help. When you carry on like this, you do yourself no good service. Frankly, such foolish rants cast a cloud over both your judgment and your stability. There are many more important things in life than Wyatt Earp. And, differing opinions on Earp simply don’t justify the intense personal bitterness expressed in your latest unfortunate diatribe. Mr. Morey is not alone in voicing his concern over Vail's approach to dealing with those with whom he has disagreements with. Casey Tefertiller is the author of Wyatt Earp: Life Behind the Legend. This book is a critical and commercial success, and has truly made a significant contribution to furthering the knowledge of the field. Unfortunately, Vail’s "pot shots," as Mr. Tefertiller referred to them, are unlikely to enlighten the field, but could result in driving out new potential field researchers and participants who are dedicated to the history. He further added the following: “So whatever Ken has created in his imagination, it is simply false. I never had any need or desire to elevate Wyatt Earp. My fidelity was always to finding the truth….” In this case, the person who has published the very least, has employed rhetoric so strong that those mentioned felt compelled to defend themselves. Unlike Mr. Vail, these are two historians who have published their work with sources to back it up. As for other claims he has made, Mr. Vail has also stated that “Not the train, but the bus in the early 20th century caused the final demise of stagecoach lines. Commercial stage lines always retreated when the railroad arrived in the area. It’s a false idea that trains did not put them out of business when competing on the same routes, and that it wasn’t until the advent of early 20th century bus service that the commercial stage lines were put out of business. It is my hope that Mr. Vail will learn from his mistakes, and start offering the field well-sourced, published, new information. He could begin to build up his own career, instead of utilizing such a harsh approach (as noted above) to those who have achieved more than he has. Copyright 2012, 2013, 2014, 2015, 2016, 2017, 2018. John D. Rose all rights reserved. Click on book cover below to order a copy.